As you consider the size of your office space—either at home or at your workplace—a corner desk can often be a functional solution that can provide ample surface and storage capability. 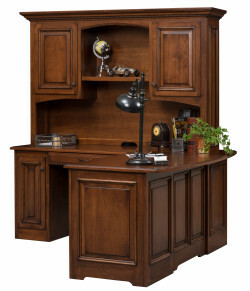 Corner desks are traditionally L-shaped, allowing for vertical storage with the addition of a hutch or credenza, as well as plenty of room for files, desk accessories and technology needs. 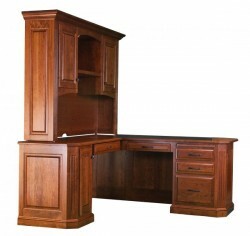 Each corner desk from Amish Originals is made-to-order and can be customized to fit your exact specifications for size. 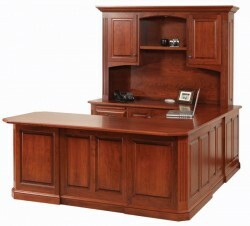 Customers also select from a wide variety of styles, stain colors, and hardware; matching shelving and seating options are also available to complete a custom look for your office. Desks are hand-crafted using only solid American hardwoods that have been sealed with a tough conversion varnish for the ultimate in durability. Select from Cherry, Red Oak, Maple, or Quarter Sawn White Oak—all of which have been harvested with environmentally sustainable methods. 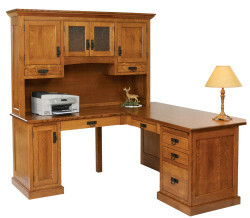 Made by the storied Amish craftsmen of Northeast Ohio, each piece of office furniture is constructed using time-tested building techniques that guarantee a beautiful and durable product. 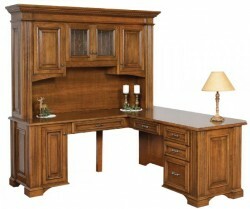 To learn more, visit our showroom in Westerville, Ohio to see how custom built corner desks could look in your home or office.